Free-jazz violin, avant-garde dance choreography, traditional Celtic and Klezmer music, tap-dance, calligraphy, poetry, comedy, and watercolor painting. Also, his interests embrace science, astronomy, psychology, chess, and ﻿juggling﻿. David's work over the years has demonstrated a distinct orientation towards ideas that are interdisciplinary. At Mills College he wrote scores for pieces that included tastes and aromas for the audience to experience along with the music. In addition to composed commissions from the UC Berkeley Dance Department he has played improvised music to accompany hundreds of contemporary dance classes for companies ranging from the West Coast's ODC to the East Coast's Limon, and from San Francisco's Alonzo King Lines Ballet to Colorado's Naropa University. in a rendition of his self-penned arrangement of a traditional Yiddish melody from Eastern Europe. This took place at Oakland's renown Paramount Theater, where two years later Kugelplex and David accompanied the humble and inspiring legend, Joan Baez. M.A. in Music Composition from Mills College in Oakland, CA., in 2003. 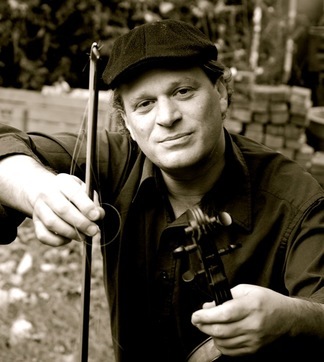 Specializations in Improvisation and Klezmer music. and studied works by John Cage and Morton Feldmen. BA Studio Art, UC Davis. At Davis, David studied with Wayne Thiebaud, Lucy Pulls, Bill Schoeler, and Bauchi Zhang. and the Oakland Interfaith Gospel Choir in a self-penned arrangement of a traditional Yiddish melody from Eastern Europe. Mandolin, Guitar, Violin, Voice, Bass, and Percussion. including PBS, Cliff Bar, and Waking Star Studios. The Freilachmakers Klezmer String Band, Rose Garden, Melita, Gary Lapow, Spontaneous Emission and many more. ~Co-produced and engineered the CD, Shierei Gan Shalom, distributed nationally by the PJ Library. ~Recorded and mixed How to Play Hand Percussion CD for Interworld/Warner Bros.
~Proficiency with microphone placement, Sibelius and Logic. French language, visual art, and graphic design.